Industrial Noise Control – Sound is a constant in our day-to-day routine. Noise, however, is a sound which is undesirable and can lead to health complications. There are many causes of noise pollution on Industrial construction sites. Industrial machinery and operations contain various noise sources. This harmful noise generation is due to noisy operation processes and the equipment used such as electrical machines and internal combustion engines, etc. Industrial noise control is complex by nature. Prolonged exposure to noise in manufacturing & industrial industries can result in compromised verbal communication, fatigue, lower productivity & work-related hearing loss. Noise Control utilizes strategies to reduce noise pollution or to reduce noise impact, for outdoor noise applications, industrial noise or indoor noise control. Noise is described as any sound in the acoustic domain both wanted and unwanted. While music and birds chirping are examples of wanted sounds, noise is more commonly used in reference to unwanted sounds such as traffic, airplane, industrial, and other annoying sounds. Noise does not have to be excessively loud to be annoying or cause interference. For Industrial and Manufacturer Noise Control we have designed Acoustic Curtain System are designed for the installation of acoustical curtain enclosures & fiberglass soundproofing blankets. Who are we and why call us? All Noise Control manufacture high performance noise control products and acoustical systems that solves noise in many different industries and comprised of premium noise control products that encompass materials that deal with noise problems. 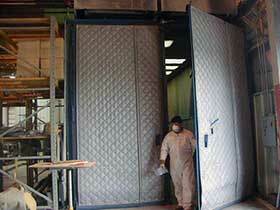 We offer noise control materials at a competitive price. We look for your valued and repeat business in the following markets and more where noise reduction, soundproofing and noise control are needed. (561) 964-9360.